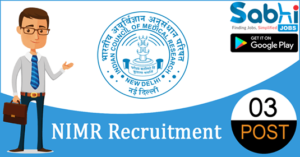 NIMR recruitment 2018-19 notification has been released on official website www.nimr.org.in for the recruitment of 03 vacancies at National Institute of Malaria Research. The candidate who is looking for Field Worker, Driver can appear for walk-in-interview on 07th July 2018. Qualification Field Worker: 12th pass in Science subject from a recognized board and two years of field experience. Driver: 10th pass from a recognized board with a valid license issued by RTO of any state. How to Apply Interested and eligible aspirants may appear for interview along with bio-data, one recent photograph, photocopies of the testimonials and also originals for verification at the time of Interview.